Project Peg-leg (title not final) is an action sidescroller featuring a bold appearance , simple gameplay (that will be deep but still simple on release), and a visual style that's a little bit minimalist and a little bit retro (but not final). Currently I'm looking for feedback on the feel of the controls and movement, and to a lesser degree feedback on the visuals and style. 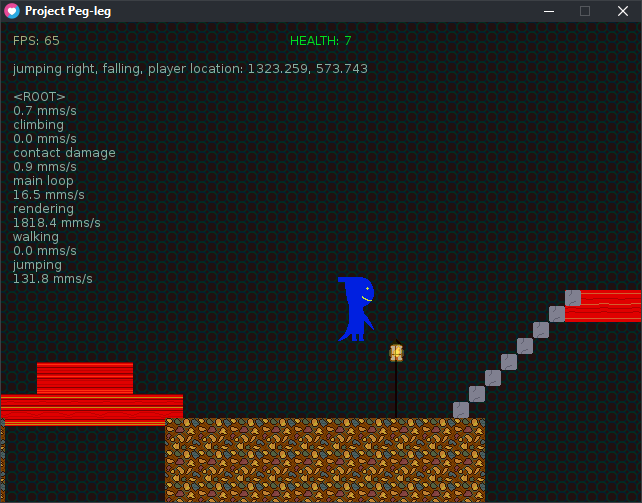 I've implemented some fixes based on feedback from my last demo; I haven't had the time to implement all of them yet. Controls are listed and changeable in the controls menu. You can pause the game and access menus with the Escape key or the start/menu button on a controller. Controller support should work fine for Xbox and Xbox-compatible controllers, but non-xinput controllers are not currently supported. Stairs are designed to be able to be walked through. Press the up or down arrow keys (or whatever you've mapped up and down to) to get on stairs when at the bottom or top of a staircase. Bug reports and suggested fixes or improvements are welcomed.